We all use USB drives for carrying data on the move. Sometimes those documents are too sensitive and we don't want anyone else to see them. 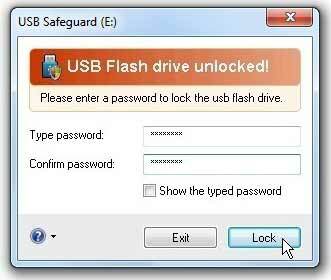 So password protecting the flash drive is needed with portability. It would be better if manufacturers themselves could provide the tool, but normally they don't. USB Safeguard is a portable tool intended for encrypting and protecting data with a password on your removable pen drive. The software uses the AES 256 bits encryption and also protects against malware. The tool is compatible with FAT16, FAT32 and NTFS file systems. For using the software first download it from its website. Once downloaded, just copy the file "usbsafeguard.exe" on the root of the pen drive and run it. If your drive is FAT16 formatted, a message will appear to reformat the drive. Click yes to proceed. 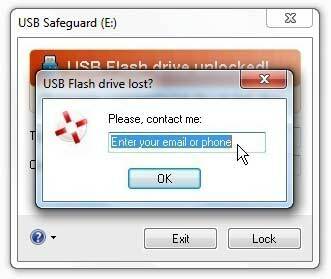 After this it will ask for a password to protect the flash drive. Put the password twice and hit the Lock button. Your drive is locked now. To unlock the drive again run the program and put your password. If you are sitting on an untrusted PC and have doubt that there may keylogger, you can use the Windows on-screen keyboard or directly press Alt+K and type the password. But what if you loose your password? In such case you can recover the password via the contact details you have registered. Contact details can be set by clicking on the help icon (?). Either e-mail or your phone number can be used as contact. The only drawback of the software is that its free version works only with USB Flash drives of size max 2 GB. However the trial version works with all USB Flash drives of all sizes up to a max of 2 TB.